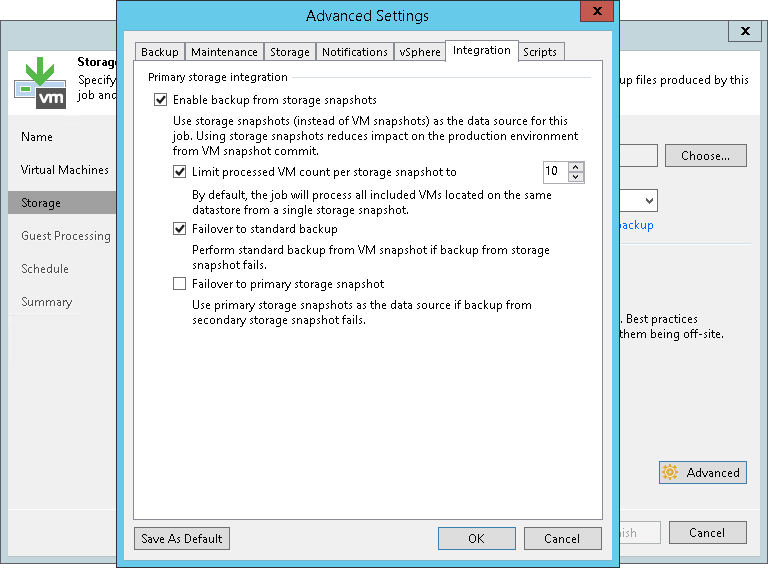 You can instruct Veeam Backup & Replication to use Backup from Storage Snapshots for backup and replication. During backup and replication jobs, Veeam Backup & Replication reads data of processed VMs from storage snapshots, which speeds up backup and replication operations and improves RPOs. You must install a license for Veeam Backup & Replication Enterprise Plus Edition on the backup server. You must add to the backup infrastructure a backup proxy that will be used for backup or replication, and properly configure this backup proxy. For more information, see Configuring Backup Proxy. You must add to the backup infrastructure vCenter Server or ESX(i) hosts with VMs whose disks are hosted on the storage system. You must check limitations for Backup from Storage Snapshots. For more information, see Backup from Storage Snapshots. Configure a backup or replication job. At the Storage step of the backup or replication job wizard, select a backup proxy that will be used for data transport. 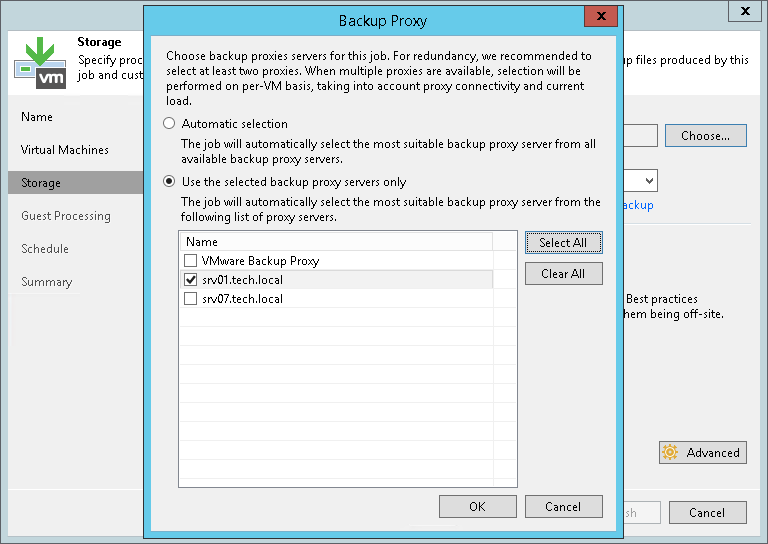 You can assign the backup proxy explicitly or choose the automatic mode of backup proxy selection. A backup proxy that you select must be added to the list of backup proxies in storage system connection settings. If the backup proxy is not added to the list in storage system connection settings, Veeam Backup & Replication will fail over to the regular data processing mode. For more information, see Adding Storage Systems. At the Storage step of the wizard, click Advanced, then click the Integration tab. Make sure that the Enable backup from storage snapshots check box is selected. By default, this option is enabled for all newly created jobs. If you add to the job many VMs whose disks are hosted on the same volume or LUN, select the Limit processed VM count per storage snapshot to <N> check box and specify the number of VMs for which 1 storage snapshot must be created. Veeam Backup & Replication will divide VMs into several groups and trigger a separate storage snapshot for every VM group. As a result, the job performance will increase. For more information, see Limitation on Number of VMs per Snapshot. If Veeam Backup & Replication fails to create a storage snapshot, VMs whose disks are hosted on the storage system will not be processed by the job. To fail over to the regular data processing mode and back up or replicate such VMs, select the Failover to standard backup check box.